Today, the US 103.5 crew traded in their microphones for scrubs as they toured Johns Hopkins All Children’s Hospital. In preparation for our eleventh annual US 103.5 Cares for Kids Radiothon it was a great time to go behind the scenes. 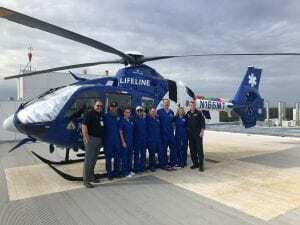 The crew learned all about our life saving services and the care we provide beyond our community. Tune in December 6 & 7! All we do. All for kids. Next post: Play Games, Heal Kids. Extra Life Game Day is this weekend!